The VoiceLive Touch 2: worth getting your hands on? 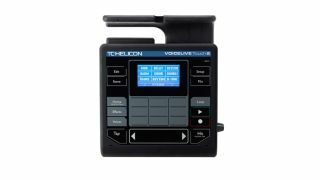 NAMM 2013: Launched a couple of years ago, TC-Helicon's VoiceLive Touch has proven popular with singers (including Brett Domino) who want a decent range of vocal processing effects at their fingertips when they're on stage. Now it's been revamped: the VoiceLive Touch 2 sports a completely reworked user interface, a supposedly unique kind of real-time control and new effects. Find out more below or on the TC-Helicon website. The VoiceLive Touch 2 will be available in March priced at $599.99/€599. The first vocal processor and looper to literally place control right at the singer's fingertips, the original VoiceLive Touch has enjoyed a meteoric rise to success - no doubt helped by influential artists such as Kimbra who has both showcased and championed its features to their full extent. The artist pedigree is directly carried over in VoiceLive Touch 2 as feedback from professional users has been instrumental in development of VoiceLive Touch 2. VoiceLive Touch 2 provides a complete suite of production-quality vocal effects, including Harmony. Its revolutionary new Touch Matrix interface with Slider FX™ allows precise real-time control and modulation, and the VLOOP™ Performance Looper adds exciting loop-specific effects to the mix. VoiceLive Touch 2 automatically takes care of vocal tone with adaptive EQ, compression, de-essing and gating. This frees the singer up to focus on the performance with hyperactive slaps and echoes, aggressive distortion and Hardtune in addition to sweetening effects like deep reverb, doubling and those uncanny TC-Helicon vocal harmonies. The new and large 2.5" LCD display helps build an easy-to-grasp visual image of the effects layout - and makes editing a cinch. The Touch Matrix buttons allows one to explore adding and removing effects and tonal colors seamlessly while singing. Use the slider bar to rock, flutter and transform the sonic landscape. Each preset also has the Hit button ready to launch multiple effects with a single touch. VoiceLive Touch 2's six-track looper offers lots of loop time and LoopAssist™ for better loops and effects like a resonant filter, stutter effect, and reverse to make one-person creations easy, unique and incredible. In short, VoiceLive Touch 2 gives singers unprecedented creative control of their live sound with state-of-the-art vocal effects and performance looping in an intuitive touch layout. A major update of the original, VoiceLive Touch 2 gives singers even more opportunities to hone their instrument, create new sounds, and move the masses. Hit button switches multiple effects from basic to shake it!